These days everyone leads a pretty messy way of living, this is a known fact. Sometimes we work so hard that even if there is a spare minute we do not want to waste it on going to gym. Does this sound like you? Don’t worry you are not the only one. What if we tell you that there is an effective workout for lazy people, would you be interested? Because it does indeed exist and it is pretty effective. In fact, feeling a little lazy is normal. 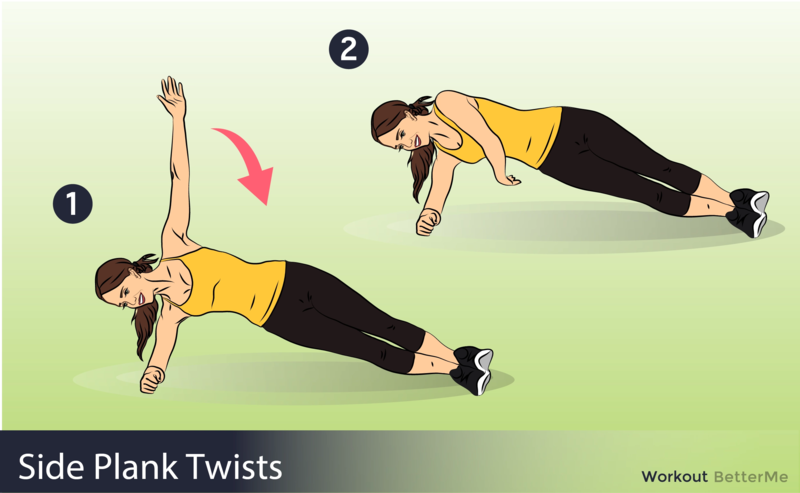 That is why we suggest a set of exercises for you that you can do without even getting up or taking your pajamas off. What is more this lazy full body workout is super effective, the results will be noticeable in no time. 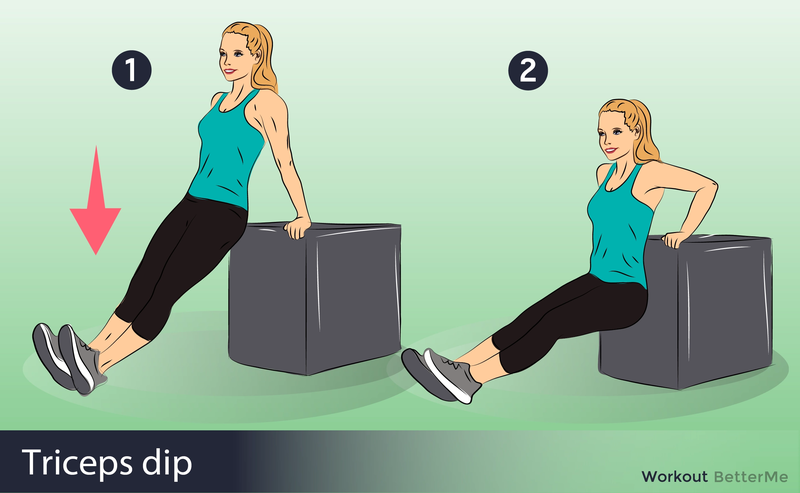 - Lie with your back flat on a bench and your legs extended in front of you off the end. - Place your hands either under your glutes with your palms down or by the sides holding on to the bench. This will be your starting position. - As you keep your legs extended, straight as possible with your knees slightly bent but locked raise your legs until they make a 90-degree angle with the floor. Exhale as you perform this - portion of the movement and hold the contraction at the top for a second. - Now, as you inhale, slowly lower your legs back down to the starting position. 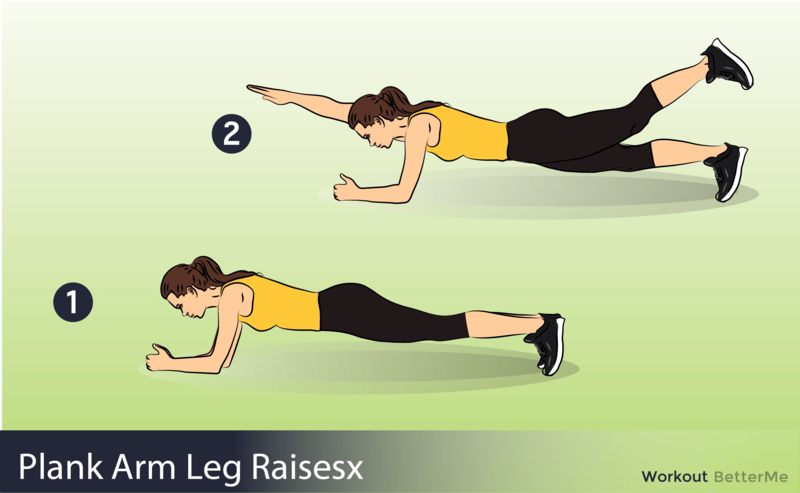 - Raise body upward by straightening body in straight line between ankles, knees, hips and shoulders. - Raise one leg, knee extended, until foot is above hip height, while raising the opposite arm, elbow fully extended with hand above shoulder height. - Repeat with opposite hand and foot. - Lie on your left side your knees straight. Prop your upper body up on your left elbow and forearm. Brace your abs as if you were about to be punched in the gut. - Raise your hips until your body forms a straight line from your ankles to your shoulders. Now raise your right arm atraight above you so that it’s perpendicular to the floor. - Reach under and behind your torso with your right hand, and then lift your arm back up to the starting position. That’s 1 rep.
- Stand with your back flat against a wall. - Walk your feet out about about 2 feet in front of you, feet spread about 6 inches apart. - Slide your back down the wall, bending your knees until they are bent at about a 90 degree angle. 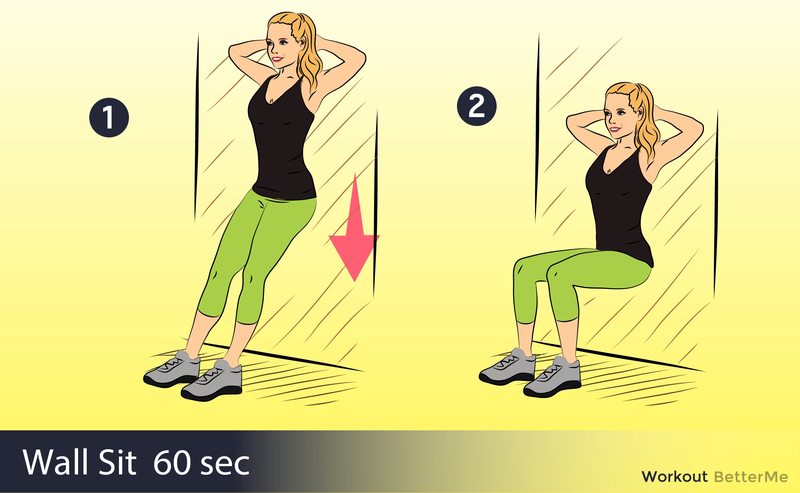 - Hold this seated position for 20-60 seconds, contracting your abdominal muscles. - Straighten your legs and come back to a standing lean against the wall. - Change the angle of your bent knees to change the intensity of the exercise. - Place your hands on a bench or box behind you with your feet together, legs straight and heels on the floor. - Lower slowly as far as you can, then press back up powerfully. Lie down on a flat surface or mat.